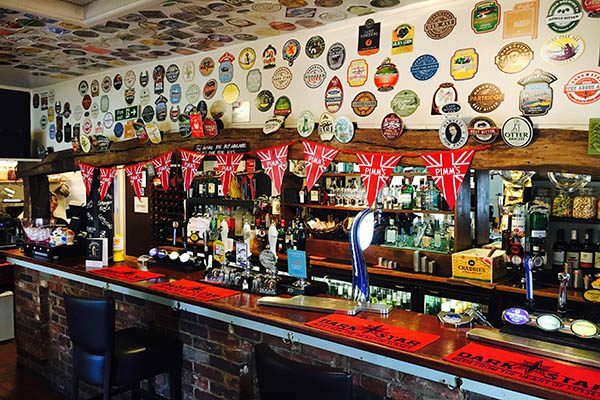 Set in the heart of West Sussex, The Sportsman pub has been a focal point of the Cuckfield community since the 1800’s. 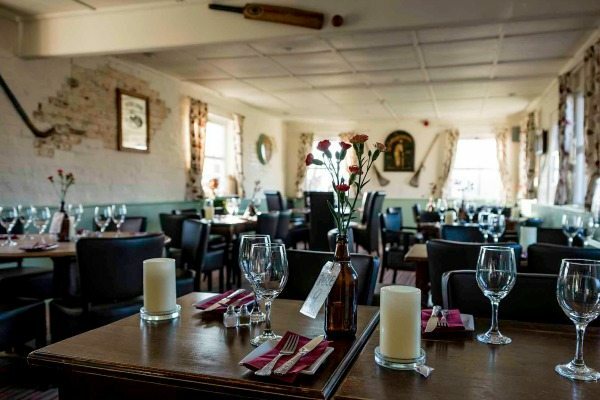 Just a 10 minute drive up the A27 from Brighton you’ll find yourself immersed in countryside, and The Sportsman Pub ready to host. Our little girls (aged 2 and 5) have been particularly difficult whilst eating in restaurants lately, to say we were a little apprehensive of what lay ahead for this Sunday lunchtime is an understatement. I came heavily weighted down with activities, treats and all of the i-devices! But I needn’t have worried at all. 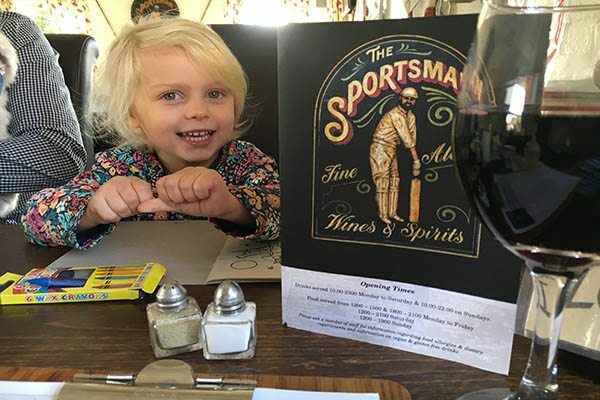 The Sportsman Pub has such a child-centric atmosphere and ethos we couldn’t have felt more welcomed, and with that – relaxed. Our girls marvelled at the unique bar space which showcases bar mats all over the ceiling and bar front, reminding us that we really has landed in a traditional Sussex Pub. We were shown to our table by smiley waitresses who offered us a high chair and ensured that our table had plenty of space for the girls to carry out their favourite ‘lap-swap’ from Mummy to Daddy. Hanging right next to our table were children’s activity packs, complete with both colouring and puzzle books together with crayons. Our girls wasted no time in beginning their master pieces, giving Mr S and I plenty of time to browse the menu and take in our surroundings. 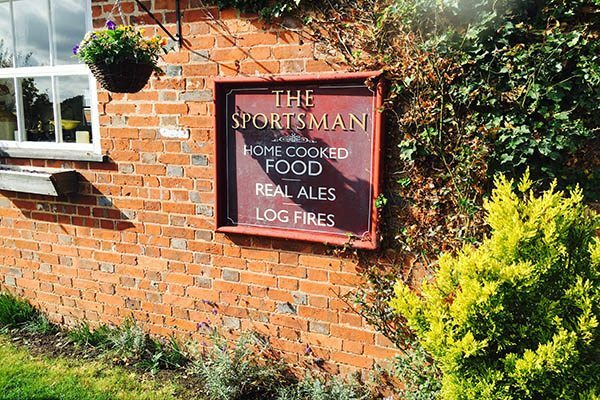 The Sportsman really does live up to its name; Lacrosse sticks, ancient golf clubs, wooden tennis rackets and cricket bats line the walls. The main dining area was fresh, spacious and bright, whilst another more rustic roaring fire dining space is situated next to the Bar. The space is designed so cleverly that both couples and large groups could happily dine throughout this quaint and delightful space. 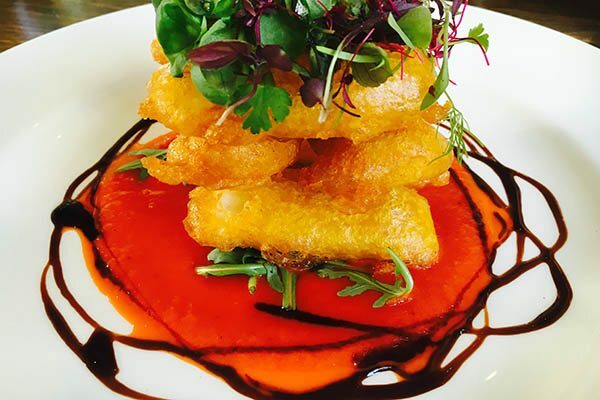 The menu boasts a great choice of mouth-watering options, my advice is to arrive hungry! 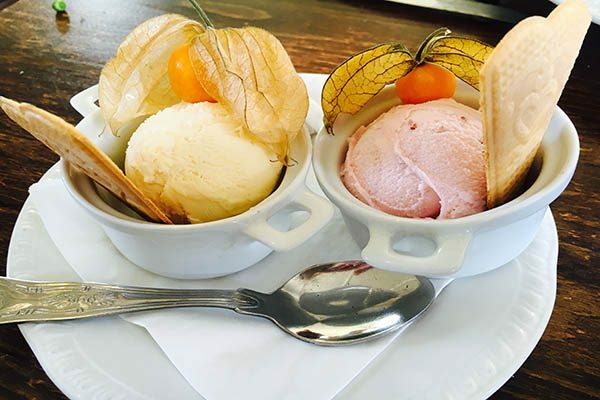 What’s more, the Children’s menu is both tempting and varied. This is rare, this is oh such good news for parents. 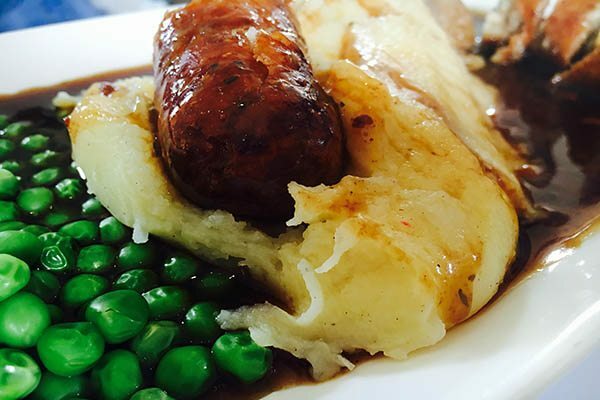 Darcie and Lila couldn’t resist ordering the butchers sausages, creamed mash, and peas, served with a delicious gravy. Without hesitation the waitress directed Mr S and I to the Sunday roasts section of the menu, having asked for a recommendation. With a couple of serious main courses in the pipeline I felt it only right to indulge in a large Rioja, together with the beer battered halloumi bites. These were little mouthfuls of heaven. A light batter encased the signature salty cheese which was perfectly balanced by the spicy red pepper & tomato coulis. I could have eaten this all afternoon. (Totally justified my over-eating, under section, ‘I wouldn’t make them at home’ of the Mum Manual). All the while our children are still colouring, and having a wander around. I didn’t wince every time our 2 year old enquired loudly “Where my lunch!” Most tables had children of varying ages, and so we felt comfortable that we sort of blended in, noise and all! The children’s meals were an ideal size, a locally sourced pork sausage sat on the bed of mash, with Lila’s favourite: peas. We are huge gravy fans, and this one didn’t disappoint. I managed to steal a mouthful, purely to check it’s temperature of course. Roasts living up to their reputation! The Sunday roasts here really do live up to their reputation. With beautiful presentation, crisp herby roasties with all of the trimmings, we were in for a treat. Mr S had the roast chicken supreme with sausage meat stuffing, whilst I chose the roast beef and Yorkshire combination. The meat was excellent quality, again all locally sourced and expertly cooked. I am very fussy about meat, and so I always find myself scrutinizing the quality and cut. A satisfied silence came over our table as we devoured this delicious lunch. 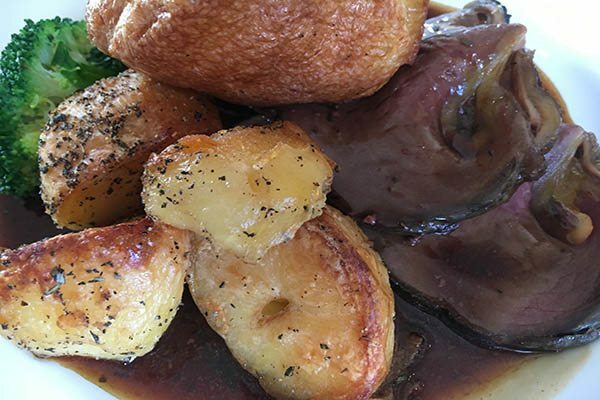 If you are roast lunch fans but worry that a pub might not do it as well as at home – look no further. The Sportsman truly does deliver the very best home cooked roastie. It’s worth pointing out that the roast dinners also come as children’s portions, so the munchkins needn’t miss out either! With barely room for dessert we committed the cardinal sin of checking out the sweet options. 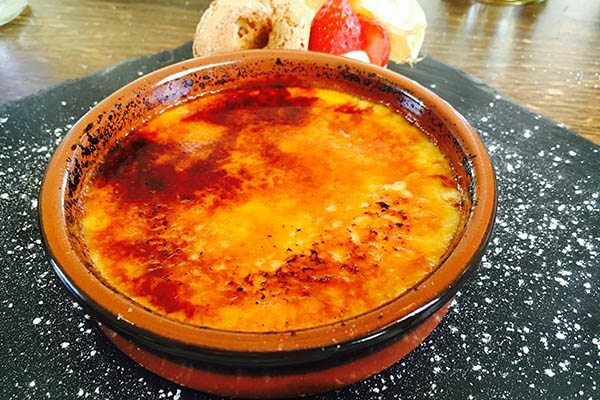 My one pud weakness is Crème Brulee, I have developed a specialist palette for this over the years, having tasted so many! Sure enough The Sportsman did not disappoint, this was warm velvety perfection. 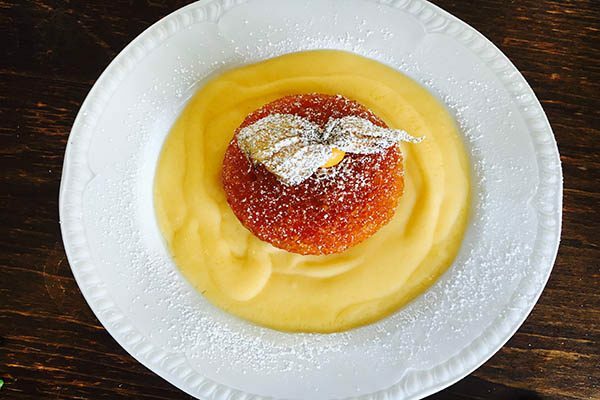 A beautifully light Syrup sponge with plenty of Custard also arrived, along with the Children’s ice creams. The girls managed to stay seated just long enough for us to finish, before the pleading to go into the huge beer garden and play on the climbing frame and slide began. Somehow we managed to waddle over while they let off steam – next time we shall bring our lively cavapoo with us. This was a fitting end to a superb lunch, and I couldn’t recommend it more to families.